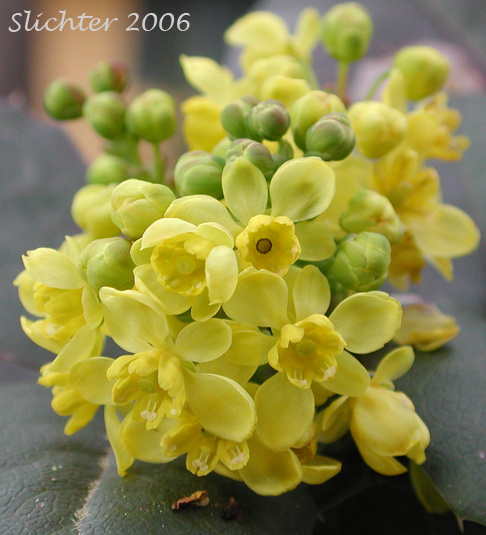 The photo above shows a close-up of the flower cluster of creeping Oregon grape ..........early April 2006. Creeping Oregon grape is a much smaller, more compact member of a family valued by landscapers for their bright yellow flowers, evergreen leaves, and bluish berries. 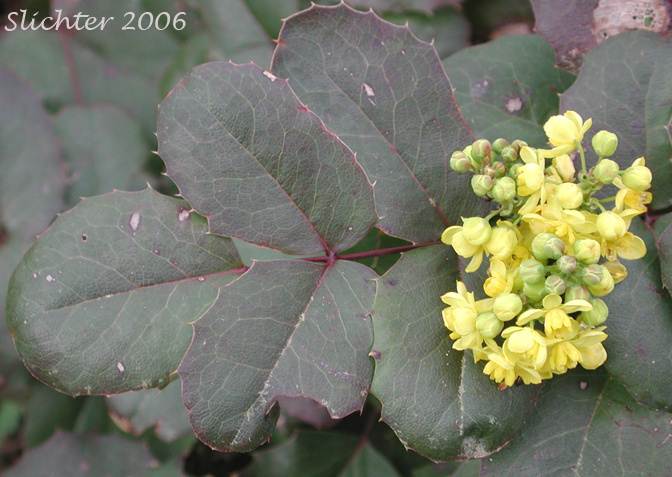 It is similar to shining Oregon grape, but is lower and more spreading, with trailing stems (repens means crawling or trailing). It is stoloniferous with stems reaching from 7.5-15 cm in height. The compound pinnate leaves have 5-7 oval leaves, generally less than twice as long as broad. The leaflet margins are edged with 15-43 spinulose teeth, and the upper surface may be glossy or dull. The compact racemes of bright yellow flowers are found at the apex of the stems. 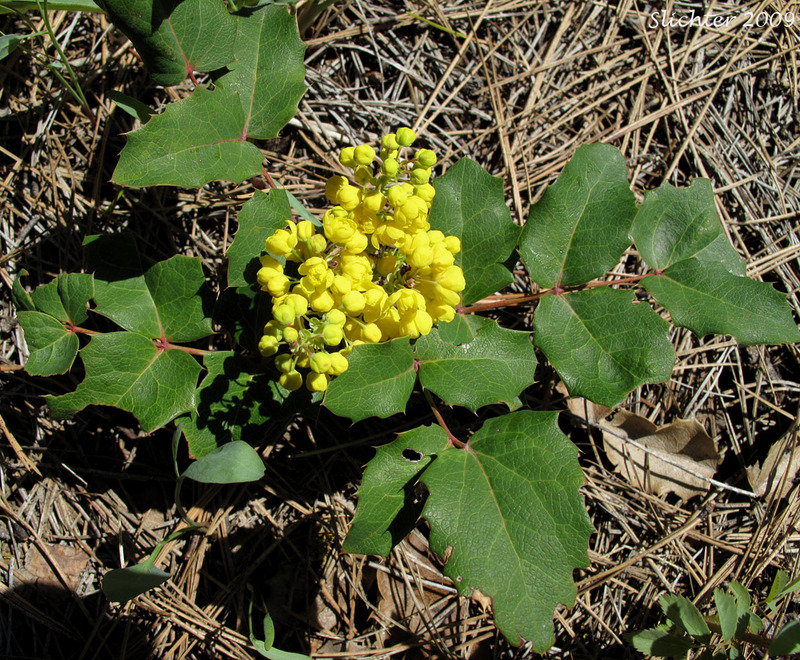 Creeping Oregon grape is a plant of open grassy to forested areas, often on north-facing slopes in the Columbia River Gorge. 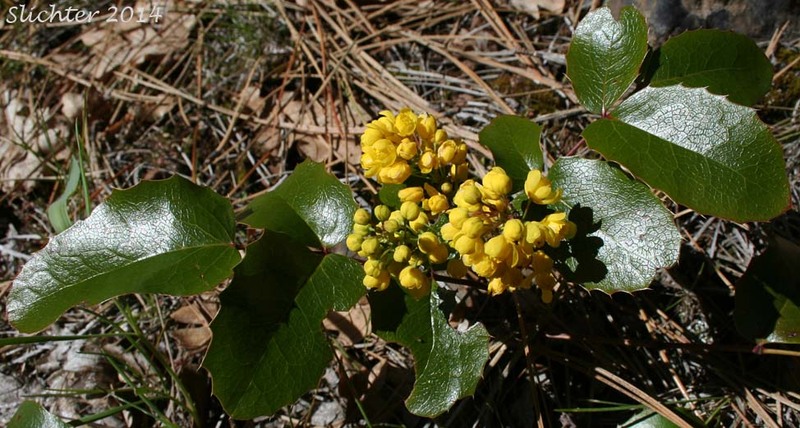 Creeping Oregon grape may be found east of the Cascade Mts from eastern Washington south through Deschutes and Wasco Counties, Oregon to northeastern California, southern Nevada, New Mexico, and north to South Dakota and Alberta. In the Columbia River Gorge, it may be found east of The Dalles between the elevations of 200'-400'. 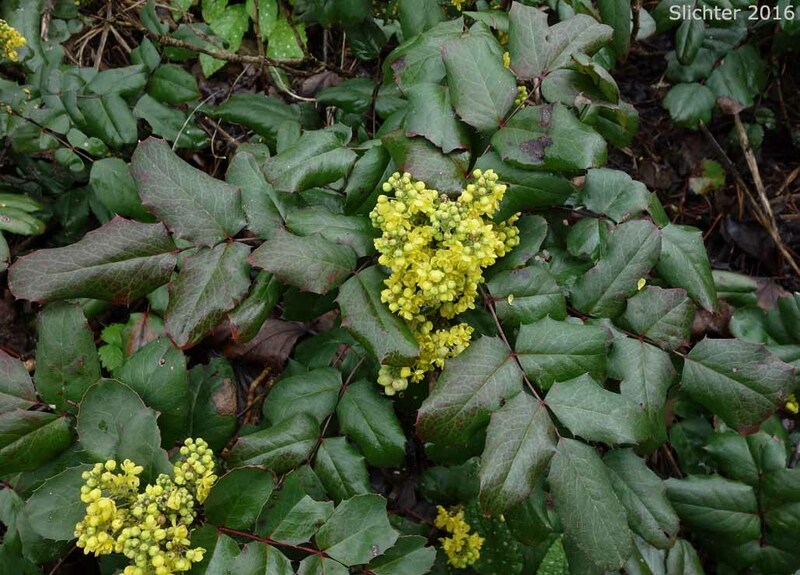 Photos of creeping oregon grape as seen in the webmaster's garden in Gresham, OR.......The photo at right was taken on March 21, 2016. 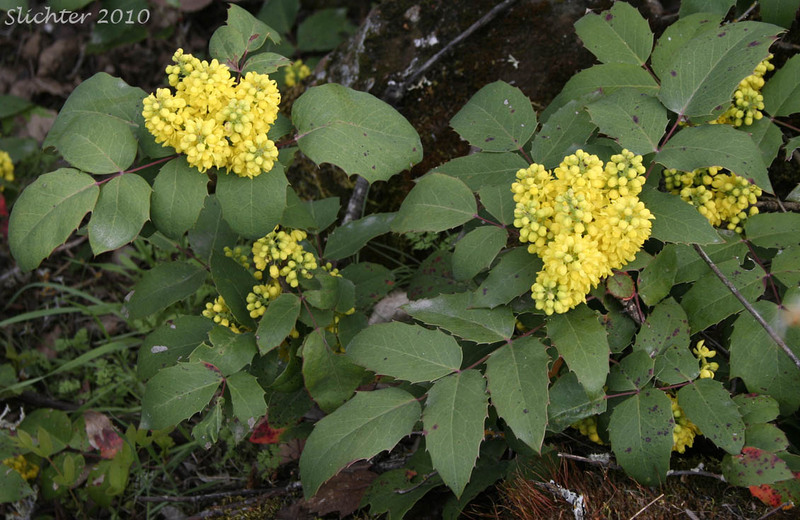 The photo above shows a leaflet of creeping Oregon grape as seen on the eastern slopes of Mt. Adams..........May 2005. This leaflet is ringed with 22 minute, spine-tipped teeth. Note how the margins are shallowly scapploped between the teeth. Creeping oregon grape from the trailhead to Canyon Creek, Klickitat State Wildlife Area.............May 8, 2009. 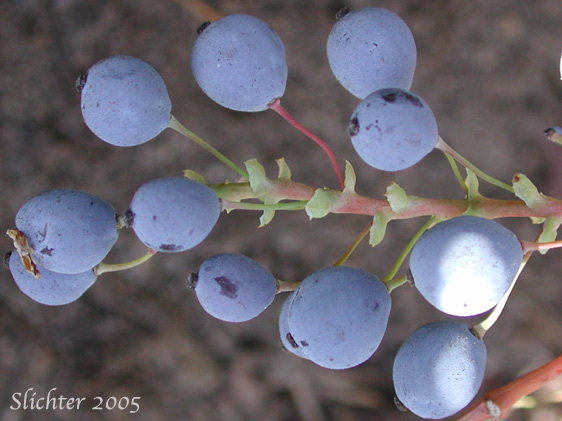 The photo above shows a close-up of the glaucous-coated berries of creeping Oregon grape as seen on the east side of Mt. Adams................August 2005. Creeping Oregon grape blooming under hawthorns along a side creek of Swale Creek, Upper Swale Creek, Klickitat County.............April 23, 2010. Creeping Oregon grape as seen at Brooks Memorial State Park, northern Klickitat County, WA..........April 28, 2014.